Savvy Rest offers GOTS-certified organic mattresses that can be customized for your body with combinations of Soft, Medium or Firm Dunlop and/or Talalay natural latex. Your height, weight, the “feel” you love and any pain issues are key. Working together, the right layers make a big difference in your comfort and the quality of your sleep. The best approach is to try different configurations at your nearest Savvy Rest dealer. Savvy Rest organic mattresses are made up of layers of natural latex. With these layers, you can create the exact feel your body needs. This video explains. 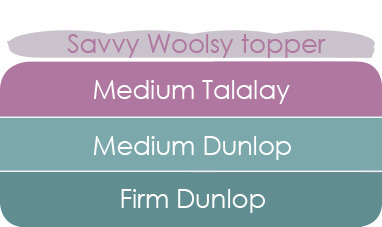 Here are some popular combinations of our Serenity layered organic mattress, with commentary. This combo offers pressure-relieving softness with stable support for the spine. Comfortable for many body types, it’s also a popular choice for guest beds and an adaptable configuration for a growing child. The top two layers can be reversed for a firmer feel. Left: Soft layering offers petite people a cradling feel with little “resistance.” Right: Those with nerve-related back pain (especially disk issues) often need very firm support; Dunlop does this best. An alternative with a bit more yield is Medium over Medium over Firm. Many couples love luxurious Soft Talalay. Left: For someone who loves climbing “into” bed, this top transitions gently to Soft Dunlop. Right: With denser core layers, a larger person or someone with frequent muscle-related backache can benefit from both types. Talalay layers can ease shoulder or hip stiffness and help relieve other chronic pain. Left: Great for petite-to-average people who love “a bed that hugs back”—but folks over 160 pounds need more density. Right: Stable core support topped with just-enough pressure relief. For people who sleep hot or those who prefer just a hint of “pillowy,” the Savvy Woolsy is a uniquely comforting surface. Here, luxurious Medium Talalay is responsive but not too “sinky.” Heavy people appreciate how well it transitions their weight to the denser Dunlop below. The separate Harmony topper creates a blissful, embracing feel. Soft Talalay makes the plushest Harmony. A Soft Dunlop Harmony is comfortably soft, a bit firmer than the Talalay. A Harmony can top any configuration; here, Talalay is layered over a stable core. In most cases, we recommend that children—especially younger ones—have a mattress with more support than cushion. The beauty of our organic mattresses is that most are customizable so you can always soften the mattress later on if you choose. If a three-layer Serenity mattress isn't right for your child, these options may suit. With its two layers of natural latex, our Tranquility mattress (shown here with all Dunlop) has a touch of softness while still offering reliable support. The Earthspring is an innerspring mattress made with natural and organic materials yet offers a traditional, medium-firm, bouncy feel. Looking for something just a tad bit different? 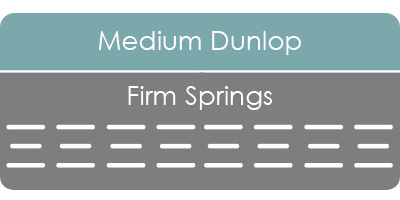 Here are some popular combinations of our SerenitySpring pocketed-coil mattress, with commentary. Talalay is known for its responsiveness, as well as its luxurious cradling feel. If you're on the petite side, this pairing of Soft Talalay and Plush springs may be the perfect configuration for you. If you’re a stomach sleeper or a back sleeper who enjoys a firm mattress, consider combining either a Medium or Firm layer of latex with Firm pocketed coils. We also offer the lower-profile TranquilitySpring pocketed-coil mattress. A good choice for teens or light- and average-weight adults who sleep on their backs. Soft surface with ample support. This combination offers a slightly firmer surface and a gentle "give" for back and stomach sleepers. Just contact us. We’ll help you choose your configuration with a brief chat (and can take an order over the phone if you’d like). Even after purchasing, if you decide you need a change in firmness, you can exchange layers for up to 90 days. We don’t sleep well until you do. 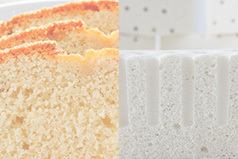 Discover the subtle differences between the two types of natural latex—Dunlop and Talalay. 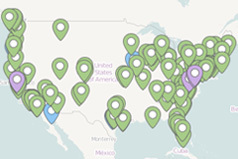 Find your nearest Savvy Rest dealer with this interactive map.